Unfortunately for me, as I started the build I quickly realised that this is not the best version to represent the sole S-58 purchased by Westland as the basis for their licence built Wessex design, specifically because it has a very different exhaust configuration with multiple exhaust pipes half way up the port engine door, rather than a single pipe low down. 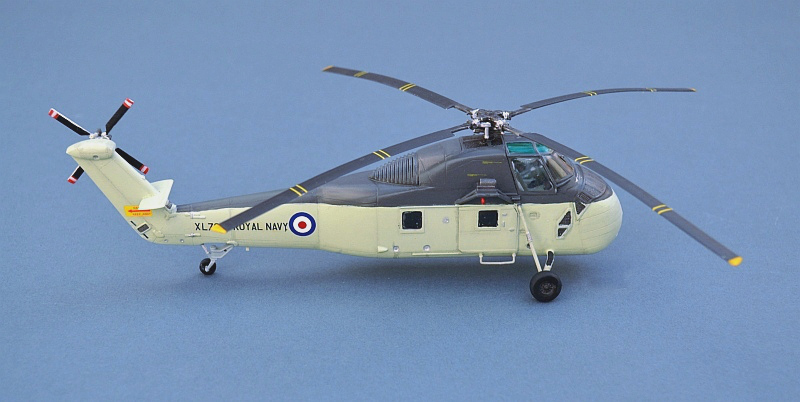 Knowing that I would now have to do some cutting and shutting, I briefly considered changing the whole thing to the early Gazelle installation (which used the existing S-58 nose doors) and using some spare Matchbox exhausts, but eventually rejected this as the attraction of the very different nose shape of the H-434, but in RN colours was too strong for me to resist! Fortunately Hobby Boss provide the alternative exhaust pipe (I presume their “A” kit has different nose doors to fit it in), so a little filling and fairing of the existing hole followed by cutting of the new outlet resolved my issue. The Sikorsky S-58 was a development of the successful S-55 design, adding a larger cabin and a lower tail boom that would be less prone to rotor strikes. A new tricycle tail dragging undercarriage was much more robust than the 4 wheel configuration of the S-55. Although it carried the same Wright piston engine as the S-55, the airframe was a better thought out design and had clear potential for development in a range of roles. Although initially developed as a Naval ASW helicopter, it saw most use as a transport, with the US Marines deploying it widely in Vietnam, where its rugged and reliable performance was put to good use. French S-58s built under licence by Sud Aviation saw extensive use in Algeria and Israeli aircraft (a mix of ex-US and French) played key roles in the Six Days War. 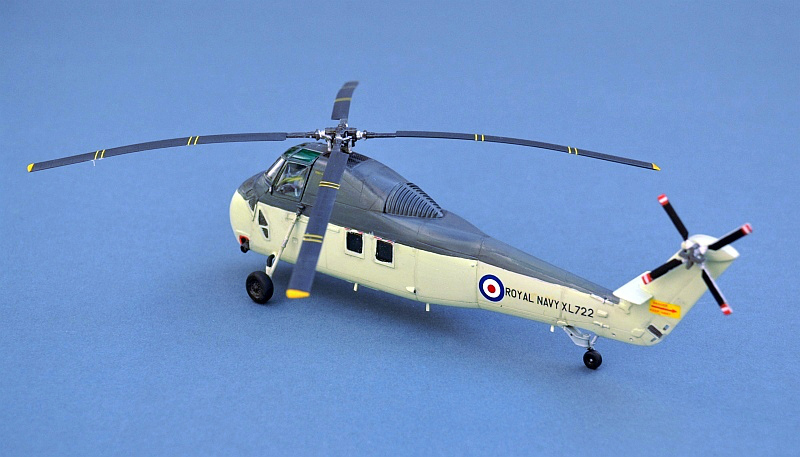 In the UK, Westland had seen much success with their Whirlwind variant of the S-55 design and with the advent of new lightweight British turbine engines, were keen to replicate this with a newer design. 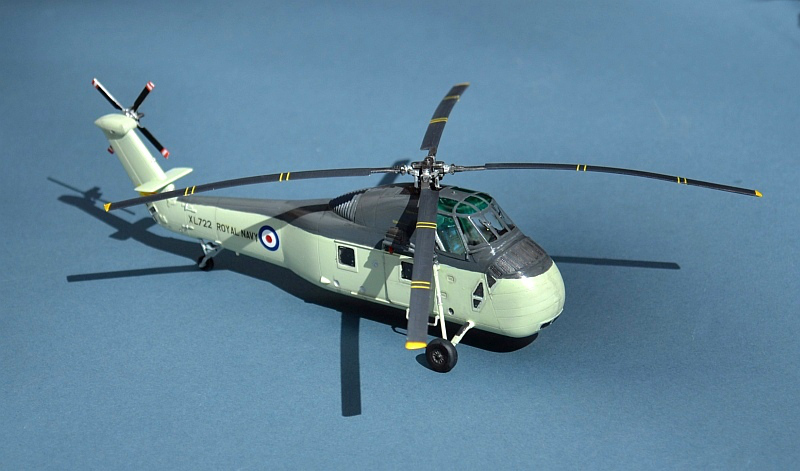 To encourage UK Government interest they acquired a single S-58 from Sikorsky and commenced a range of demonstrations that culminated in agreement to develop the aircraft to carry a single Napier Gazelle gas turbine and an order to provide the RN with its first purpose designed ASW helicopters. 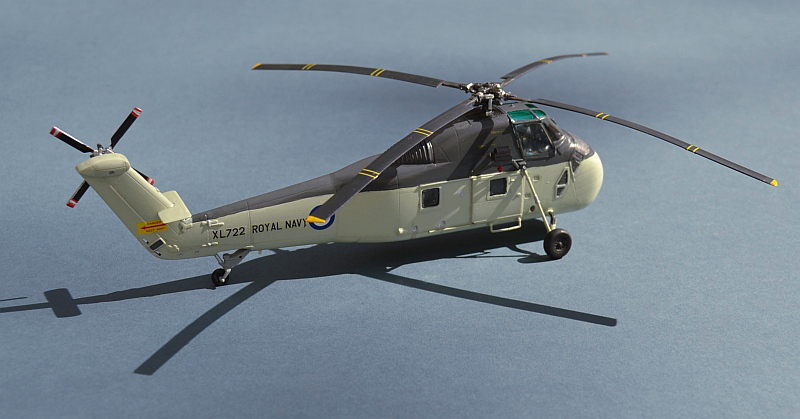 Only two and a half years after the S-58’s first flight in the UK, the initial UK-built Westland Wessex HAS.1s entered RN service as the first mass produced gas-turbine powered helicopter and the most advanced ASW platform in the world. Haha – proper naval colours and an odd looking “sort of” Wessex, how could I resist building one of these ! This was fully intended to be a quick and simple sanity restoring build of a modern kit and standfast the colour scheme, I planned for it to be built “out the box”as Hobby Boss intended. However, not surprisingly, a few changes led to a few more, and so on. The underlying kit is Hobby Boss’ UH-34D Choctaw, representing a Vietnam era US Marine transport aircraft. It’s a good little kit, although like many of that manufacturer’s range, it has a few interesting interpretations of shape, that may grate on the nerves of the serious modeller. Nevertheless, it is an easy build, with excellent fit, nicely judged detail and (in this version) a reasonable price. Compared with the Revell/Italeri and Matchbox Wessex kits, this one is a far simpler and much less fiddly build (but a bit more complex than that from FROG). It comes with fair interior detail, consisting of some simplified cockpit seats, with cyclic sticks and prominent rudder pedals, plus a nicely done set of cabin canvas troop seats within an otherwise slightly bare cabin interior. The two cabin door guns (if fitted) will fill the gap nicely so that the level of detail provided is entirely adequate. A number of other detail changes were needed, mainly around nav lights and radio antenna. I kept the cabin door shut as I really wasn’t sure what Westland had fitted in the S-58 cabin on-delivery (I bet there was something in there once the Gazelle was fitted though) . The interior and seats may make a reappearance elsewhere long with the cabin guns in due course. I also fitted the very nicely moulded top vent section left over from an Italeri Wessex, not that there was anything particularly wrong with that provided by Hobby Boss. Paint is my normal Humbrol enamels, and the decals come from the kit and out of my spare decal box. The aircraft only existed with the piston engine and these markings for a very short period. On delivery from the US it was reassembled at RNAY Fleetlands in June 1956 and flew to Westlands at Yeovil in civil markings. 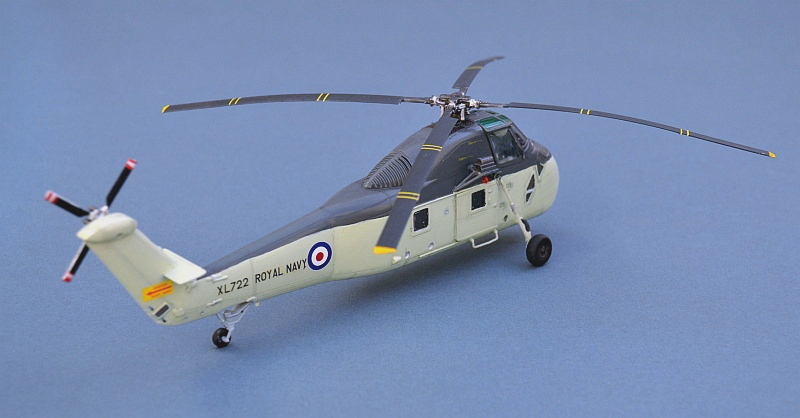 The military serial XL 722 was allocated in July 1956 and it conducted a number of test flights with RN markings until December 1956 before being converted to carry the Gazelle gas turbine, with which it made its first flight in May 1957.